No tasks are available for ALMOST ALL?! Message boards : Number crunching : No tasks are available for ALMOST ALL?! I haven't been receiving any new tasks since July 12. The cache was probably full from other projects, but I'm also assuming that those project has a higher priority of some sort than GPUGRID and that's why it never get any. 7/15/2018 4:03:41 PM | GPUGRID | Sending scheduler request: Requested by user. 7/15/2018 4:03:44 PM | GPUGRID | No tasks are available for the applications you have selected. Can someone please verify and advice. Message 49879 - Posted: 15 Jul 2018 | 17:35:38 UTC - in response to Message 49876. I can only say that I have been getting the Longs and Quantum Chemistry all day. I suggest that you suspend your other projects and try again. EDIT: Your computers are hidden (bad idea). QC is only available for Linux. And I think there are some problems with the Windows GPU work units at the moment. Message 49909 - Posted: 16 Jul 2018 | 22:04:08 UTC - in response to Message 49879. I suggest that you suspend your other projects and try again. 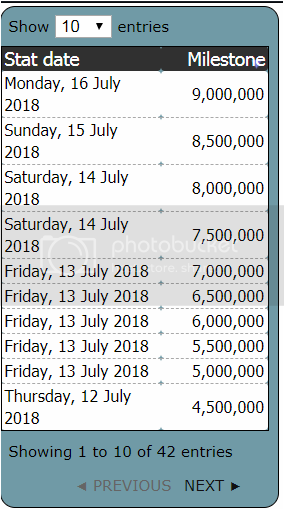 Thank you for your response and suggestions..
More than 4.5 Million BOINC Credits in 4 days says my computer is doing fine. 7/17/2018 12:57:10 AM | GPUGRID | Sending scheduler request: To fetch work. 7/17/2018 12:57:47 AM | GPUGRID | Sending scheduler request: To fetch work. With hopes that ... it becomes a priority, as a project and by the project, and send me some tasks. Please read Jim's post again. Your GPU was not in question. Message 50006 - Posted: 23 Jul 2018 | 12:36:59 UTC - in response to Message 49879. Message 50007 - Posted: 23 Jul 2018 | 12:50:07 UTC - in response to Message 50006. And the Windows GPU work units have a certificate problem of some sort (there is a discussion on it), and so are not working either. Your GTX 1080 Ti will work very well on Folding however, if you want to give it a try in the meantime. Message 50013 - Posted: 23 Jul 2018 | 16:55:50 UTC - in response to Message 50007. Yes they did ,.. all error-ed out. I'll stick with the project I have right now (Einstein and Primegrid) ,.. unless otherwise they start to behave strangely. But, why Folding isn't listed under the client's projects? Does it have another name? Really, thank you for your time and advice, most appreciated. Message 50015 - Posted: 23 Jul 2018 | 17:05:57 UTC - in response to Message 50013. Folding@home is not a BOINC project. You have to install their client from their homepage, and you should disable your BOINC projects (at least the GPU projects). Message 50016 - Posted: 23 Jul 2018 | 18:20:16 UTC - in response to Message 50015. I have came across the project long time ago but didn't crunch any tasks. I guess I'll pick a moment and ,... give it a try. Message 50018 - Posted: 23 Jul 2018 | 19:00:27 UTC - in response to Message 50016. I would say Folding is a good alternative to GPUGRID; I have it running right now on my Windows 10 machines (and had already tried it out last year for a short period of time).